Who knew the mission would come with rewards. Rick Cantrell is an up and coming actor, who’s been featured in the top ten of the sexiest men’s polls. He also has stalker on his trail. Jordan Riker is a lion shifter with a difficult past. He quit his pride due to his controlling father’s demands, and he was burnt by his boyfriend shortly after. Now, he’s a newbie bodyguard, assigned to protect the seriously hot, Rick Cantrell. 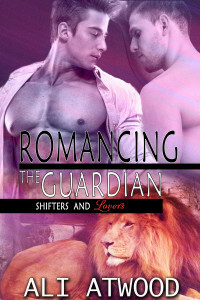 Though Jordan is immediately drawn to the charismatic actor and recognizes the connection between them, he resists Cantrell’s sexual advances to uphold his professional standards and guard his heart from further hurt. Rick Cantrell is a never-take-no-for-an-answer kind of guy. Despite his bodyguard’s best efforts to push him away, Rick thinks he may have the man of his dreams in Jordan Riker.